It’s cold, damp, goodness knows what happened to Spring. We need warm comforting food like a quick homemade pot noodle; the next in my series on Real Fast Food. This week I’ve taken a real step away from my comfort zone and recorded this recipe in real-time at my kitchen table. I’ve uploaded it to YouTube so that you can see that I’m not fibbing when it comes to homemade fast food. At less than 50c per portion, per adult, quick homemade pot noodle is a fantastic value-for-money alternative to dialling the take away. There is also no fat, whatsoever in this recipe. If you leave out the soy sauce it is also gluten free. Click below to play the video of me preparing it live, no breaks, all 1 take using my mobile phone. Just excuse my hoarseness as I’m a bit under the weather at the moment. If you’re not bothered you can skip the video and go straight to the recipe. Boil a kettle of water. Peel and chop the spring onions. 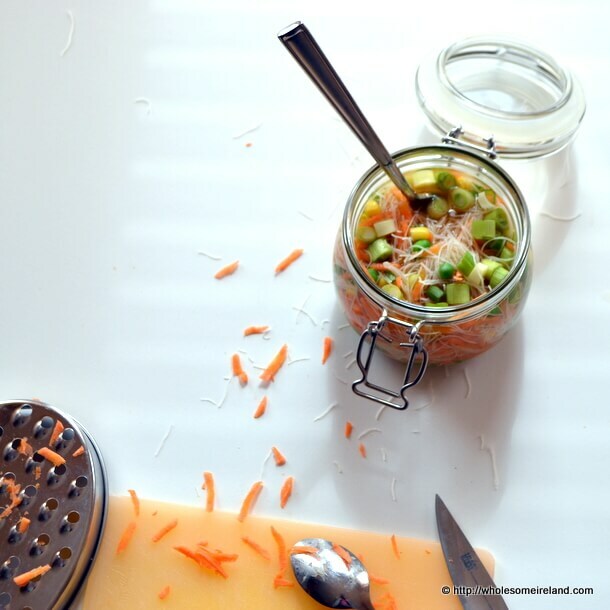 Grate the carrot into a chunky shred. Put the ginger and garlic paste into a large jar, followed by the soy sauce, noodles, peas, sweetcorn and grated carrot. Once the kettle has boiled pour over with hot water up to 3/4 level. Stir well. Loosely cover the jar using the lid for 30 seconds. If you wanted to add protein you could add in shredded omelette, leftover roast chicken, ham, fresh beans etc at this point. Serve & enjoy! Great stuff as always BUT I was really hoping to see YOU. I am disappointed! What a great idea! Spring is having a hard time showing up here in Minnesota, this would be perfect on the gray, gloomy, cold days! Did you make your own garlic ginger paste or purchase it? Thanks for sharing! Hi Patty I buy a jar of garlic & ginger paste very cheaply in a local Asian Food Store. I hope Spring appears for you soon. Good to know! I was tempted for about 1/2 a second to make my own, then I came to my senses! I’ll look at the store for it! Well I’m all for saving time if you can in this case. I hope you find some. Shouldn’t be too hard, it’s commonly used in Indian cuisine. Hi Aidan, I buy a jar of the garlic & ginger paste in my local Asian foodstore for about €1.29 each. It lasts me a month give or take & I use it when I’m stuck for time. I’ve also seen it in my local greengrocers! This sounds lovely, I think it would be perfect for lunch at work, always looking for something quick and easy but also warm that I can bring in with me! Can you freeze fresh spring onion and carrot and use that so you can always have ingredients on hand? Hi Buttmonki the spring onion and carrot have different water content levels so I’m afraid they are better fresh in my experience. Carrots will keep in a crisper drawer of your fridge for up to 1 month providing it is not wrapped in plastic and is resting on some dry kitchen paper. You could try slicing the spring onions and then freezing them in a sandwich bag but I’m not sure how successful this would be. They’re not essential. You can make this recipe without both as you have plenty of vegetables from the sweetcorn & peas!